Is Digital Marketing Killing Magazine Ads? A report last week by the Publishers Information Bureau found that advertising pages in the nation’s magazines declined by 7.4% compared to the first half of 2007. With the stock market down by about 20%, and house prices down at least that much in some parts of the country, a 7% dip in magazine ads may seem less frightening than the prospect that Angelina Jolie will somehow end up being mother to all of the world’s children. However, there are two inexorable trends in marketing right now and neither bode well for magazines mid or long-term. The economy will rebound at some point, but even when that happens, will magazines recoup their share of the advertising pie? In general, I think not. First, marketing is increasingly about measurability, and on that front magazines score no better than any other “traditional advertising” tactic like TV, radio, or newspaper. I would put magazines ahead of outdoor on that scale, because at least they have audited circulation. But how does the savvy marketing director (or agency media buyer) determine the financial impact and ROI of magazine? Short of tracking URLs and phone numbers (which basically pass the measurement buck off to another medium), it’s pretty difficult to isolate the effect of a magazine buy – which is why digital marketing is growing and everything else is stagnating in this down economy. The second issue for magazines is speed. The lead times required by monthly magazines for advertising and editorial are positively anachronistic. Consumer magazines are working on their October issues right now. Seriously? 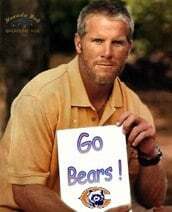 By October, Brett Favre could be playing quarterback for the Bears, and all of California could be on fire. In these uncertain times, committing to expensive magazine ads 90 days in advance seems like a leap of faith that fewer advertisers are willing to make. And speaking of speed, magazines without an especially sharp editorial focus and solid reporting are going to have a tough time in a culture where information is conveyed in 160-character bites RIGHT NOW. Interestingly, some of the magazines showing the biggest decline in ad pages this year are those who cover topics that are perhaps covered better online by sites and blogs. Newsweek (-22.4%) Time (-21.1%) and U.S. News (-30.3%) See www.huffingtonpost.com, www.nytimes.com, and Twitter, where thousands of people are discussing current events as they happen, not a week later. Interestingly, one area of magazine-ville that showed consistent gains was food publications. With gas and food prices soaring, Americans are eating out less and trying to craft delicious meals at home. I’m not sure this trend is going to do anything about the obesity problem, however, as Cooking with Paul Deen ad pages were up 31%. That lady is physically incapable of executing recipes without at least one pound of sour cream.